Along with the Aspire 5 series release, Acer outed a more performance-focused version named Aspire 7 that runs on Intel’s quad-core Kaby Lake-H processors and sports a decent GTX 1050 GPU, which is enough for casual to moderate gaming. There are also few notable changes in the chassis compared to the Aspire 5 – brushed aluminum is the main material used making it feel a bit more robust and interestingly, the keyboard feels slightly altered as well. Although it may seem like the Aspire 7 is made for gaming, judging by the specs sheet, the notebook isn’t marketed as gaming-oriented by the OEM nor does it feature the usual flashy appearance with red accents or a gaming-optimized keyboard. In any case, the Aspire 7 seems like a great choice if you are looking for an affordable 17-inch high-performance laptop that’s also able to drive most of the games in low to medium graphics settings. We would like, however, to see how it performs in other areas like battery endurance, screen quality and temperature handling. The retail package contains all the usual user manuals, AC adapter and power cord – nothing out of the ordinary. As we already mentioned, the Aspire 7 and the Aspire 5 share some similarities like general appearance and overall portability. Just like the Aspire 5, the Aspire 7 isn’t the lightest laptop out there but manages to keep the weight under 3.0 kg (2.9 kg to be exact). Not that bad for a 17-incher to be honest. Its thickness, though, isn’t as impressive – measuring at around 27 mm, we can definitely put the machine in the “slightly bulky” category but we hope the cooling system will benefit from this. The most notable change here compared to the Aspire 5 is the lid. Now featuring brushed aluminum sheet, the laptop feels a bit more rigid in the middle, isn’t susceptible to severe twisting but the bottom chin still feels a bit flexible due to the hinges being placed too far apart leaving the middle of the screen without any support. Speaking of the hinges, they feel a bit overly tightened and don’t allow opening the machine with just one hand. 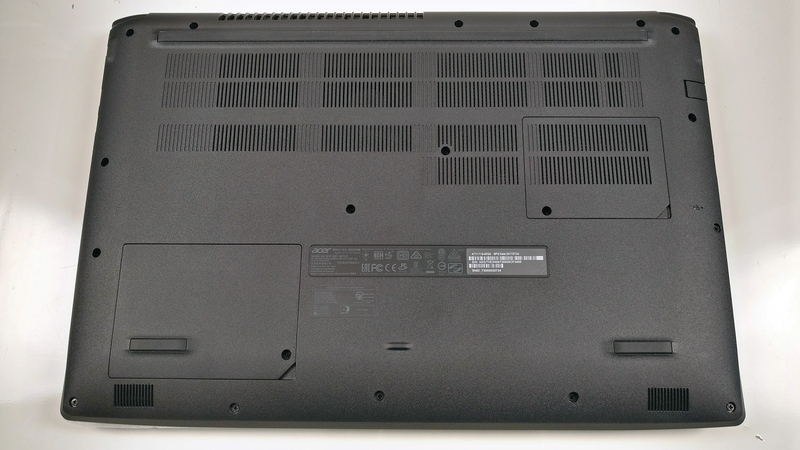 As for the bottom, it continues to use the slightly roughened plastic with some grills for dispersing the heat and two service hatches for easy access to the 2.5-inch HDD and RAM sticks. We’ve also noticed something quite irritating – the left edge under the palm rest area wobbles even when placed on an even surface – it must be due to the unbalanced base or the silicone leg is just a tad shorter on the right. Either way, it might not be an issue with all the units out there. 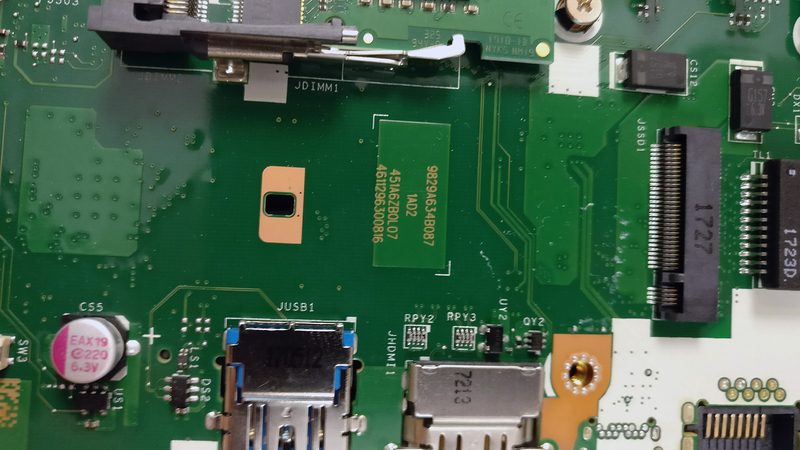 Moving on to the sides, we see the standard I/O configuration, which appears to be well-distributed – the left side holds most of the connectors like RJ-45 for LAN, USB-C 3.1 (Gen 1), HDMI, USB 3.0 and the SD card reader. The right side comes with the DC charging port, two USB 2.0 connectors and the 3.5 mm audio jack. 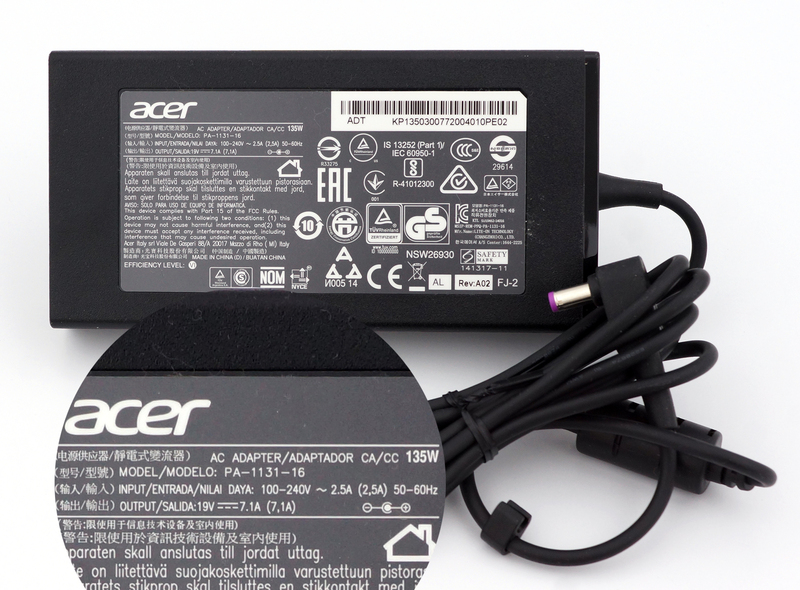 Opening the lid reveals a familiar Acer design that we’ve already seen in several other notebooks. The brushed aluminum interior is still a fingerprint magnet but serves as a fairly stable construction. Only the area around the touchpad appears to be bending just a little but nothing too serious in our opinion. Besides, this is a budget-oriented laptop anyway. While we are on the touchpad, let’s just say it’s identical to the one on the Aspire 5 – surrounded by chamfered edges, has smooth gliding surface, it’s fairly responsive and features light and clicky mouse clicks. And as for the keyboard, well we’ve noticed a small but notable change compared to the cheaper Aspire 5. The keycaps still come with that slightly concaved surface for optimum typing comfort and provide that light but clicky tactile feedback. 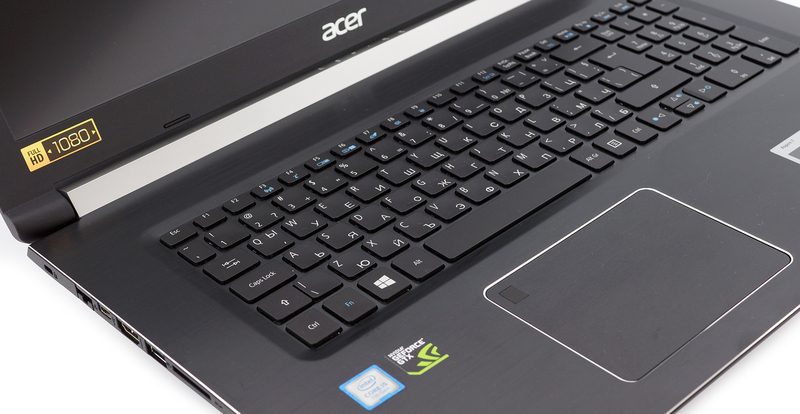 However, we can definitely feel the increased key travel while typing compared to the Aspire 5. The latter’s keys felt somehow “dull”. Still, the arrow keys aren’t really that comfortable for gaming but this isn’t marketed as “strictly gaming laptop” anyway. The Aspire 7 seems like a well-made 17-incher with much fewer compromises than we would have expected, especially given the price tag. We also liked the keyboard and the touchpad, which often left neglected in these type of notebooks. 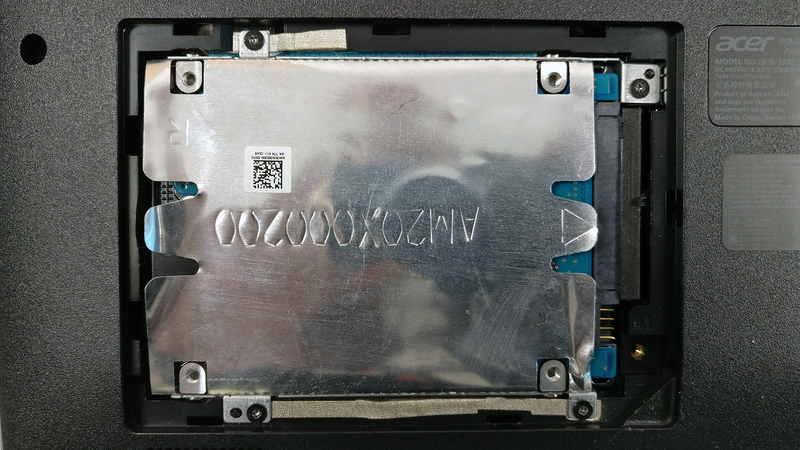 The disassembly process and upgrade options are absolutely identical to the Aspire 5 (17-inch) – there are two small service covers for the 2.5-inch drive and one for the memory slots. But if you wish to access the rest of the internals, you will have to dig deeper by removing the whole bottom piece. 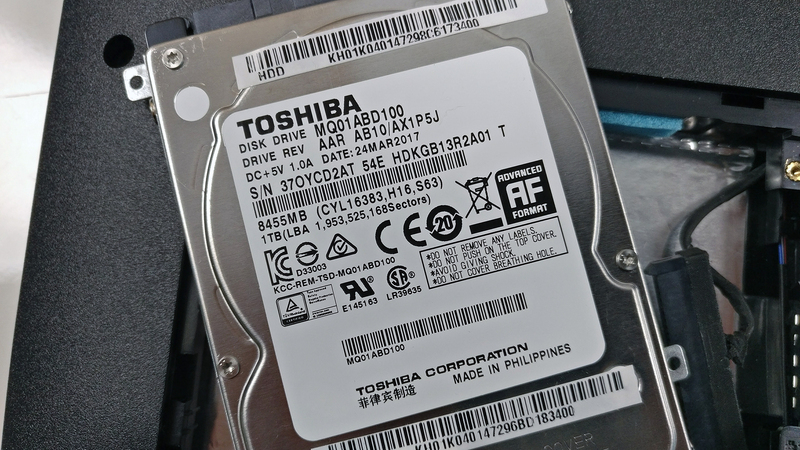 The unit we’ve tested came with just one 2.5-inch HDD from Toshiba with 1TB capacity but thanks to the M.2 SSD slot, the storage can be expanded. 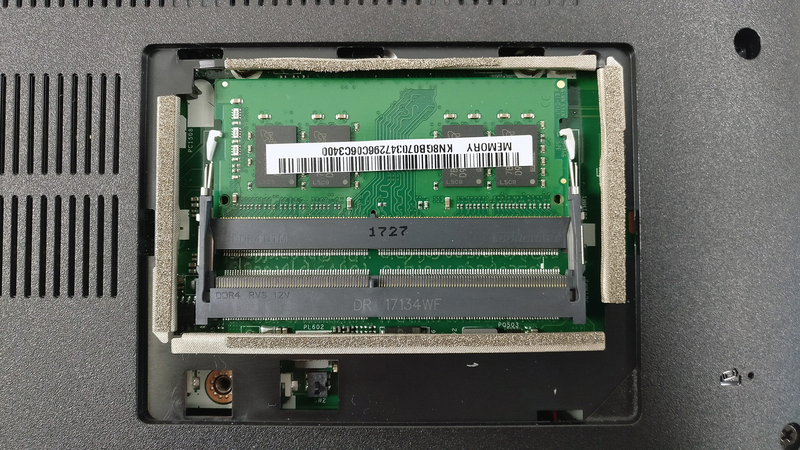 The M.2 slot supports PCIe NVMe-enabled drivers coming in 2280 standard. 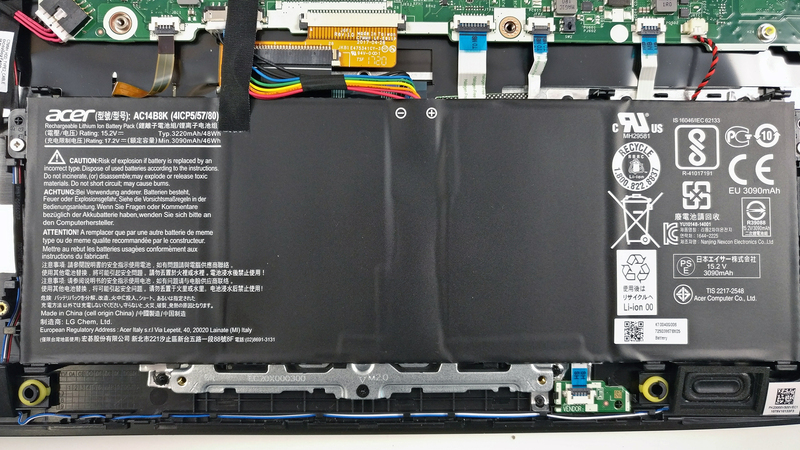 The motherboard holds two memory slots and both can be accessed via the small service hatch. 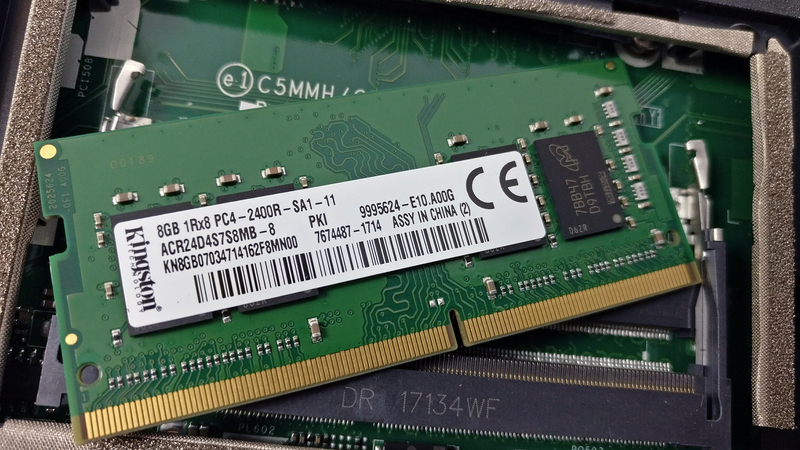 Each slot supports up to 16GB of DDR4-2400 chips but our unit came with just one 8GB Kingston stick. 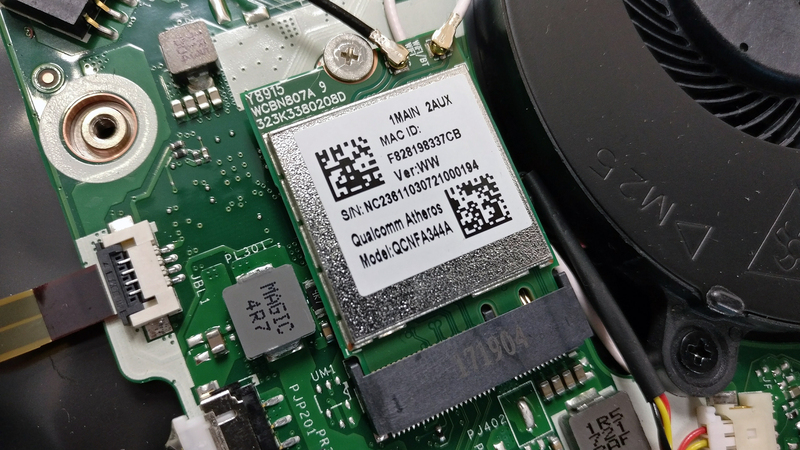 The Wi-Fi card is placed near one of the cooling fans and it’s Qualcomm QCNFA344A. The battery is rated at 48Wh and it’s placed under the wrist rest area. 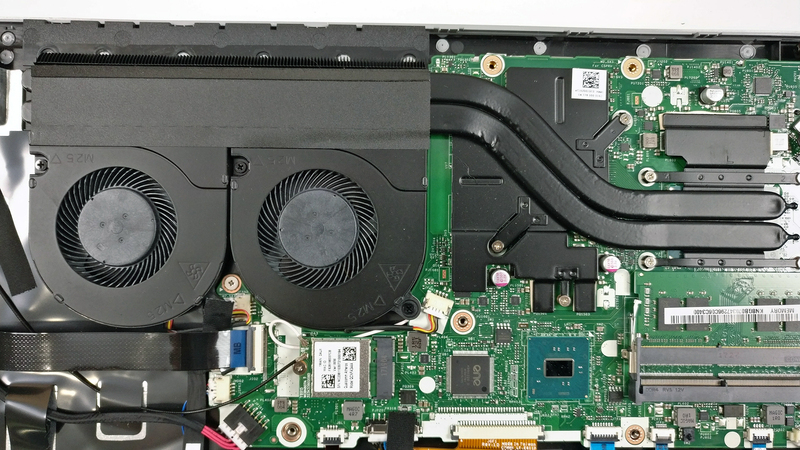 Although the cooling design doesn’t seem all that reliable because we’ve seen other laptops with the same layout – both cooling fans stuck together and just two small heatpipes connecting the CPU and GPU heatsinks and sharing the heat. However, probably due to the “lightweight” hardware, the system was able to cool things off quite easily. It appears that the current Full HD (1920×1080) IPS panel can be found in a long list of laptops – Acer Aspire 5 (17-inch), ASUS ROG Strix GL703VM, ASUS ROG Strix GL702ZC and Lenovo’s Legion Y920. So we already know what to expect from the display. Anyway, it provides 127 ppi pixel density and 0.1995 x 0.1995 mm pixel pitch. The screen can be considered as “Retina” when viewed from at least 69 cm. WE’ve recorded a peak brightness of 420 cd/m2 in the center and 404 cd/m2 as average across the surface with 10% maximum deviation. The correlated color temperature is a little colder than the optimal (6500K) – 7220K. As we go along the grayscale, the color temperature falls down a little – 7220K but still a bit colder than it should be. 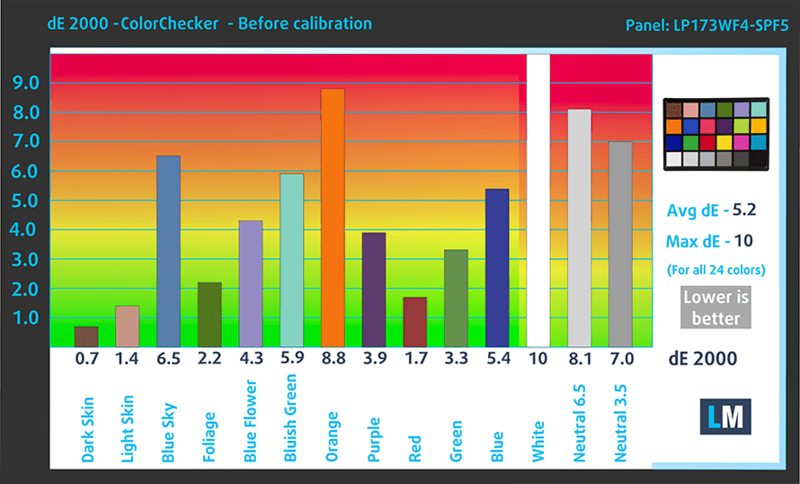 You can see how these values change at 140 cd/m2 (28% brightness). The relative dE2000 (color deviation) compared to the center of the screen shouldn’t be more than 4.0 if you are planning on using the screen for color-sensitive work. The contrast ratio is excellent a well – 1000:1. 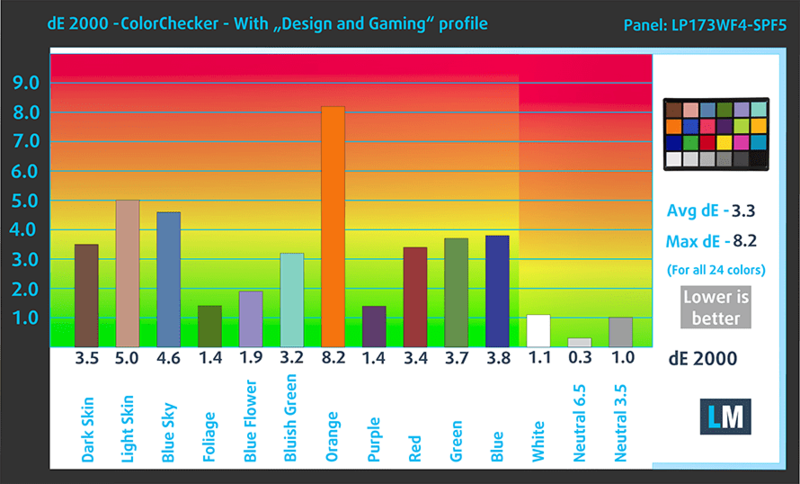 As expected, the sRGB coverage is 89% ensuring good multimedia and gaming experience. We recorded Fall Time + Rise Time = 23 ms. 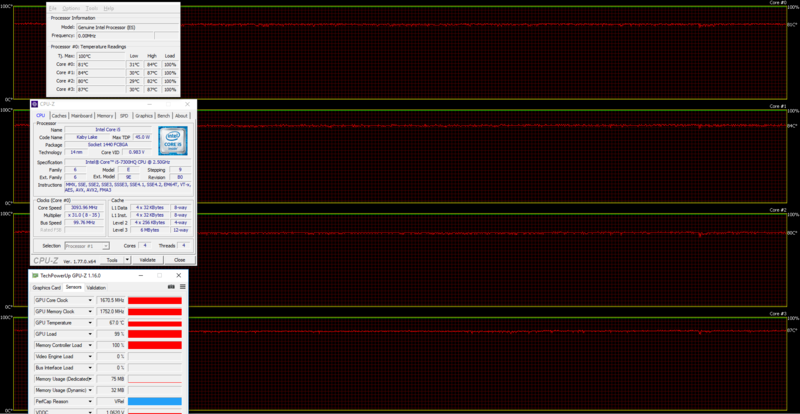 The screen doesn’t use PWM – only some extremely high-frequency pulsations appear at times. As we already stated in the Aspire 5 review, we are extremely happy with the display quality as it provides all of the essentials for a good gaming and multimedia experience. It has high maximum brightness, wide sRGB coverage, good contrast and lacks PWM. 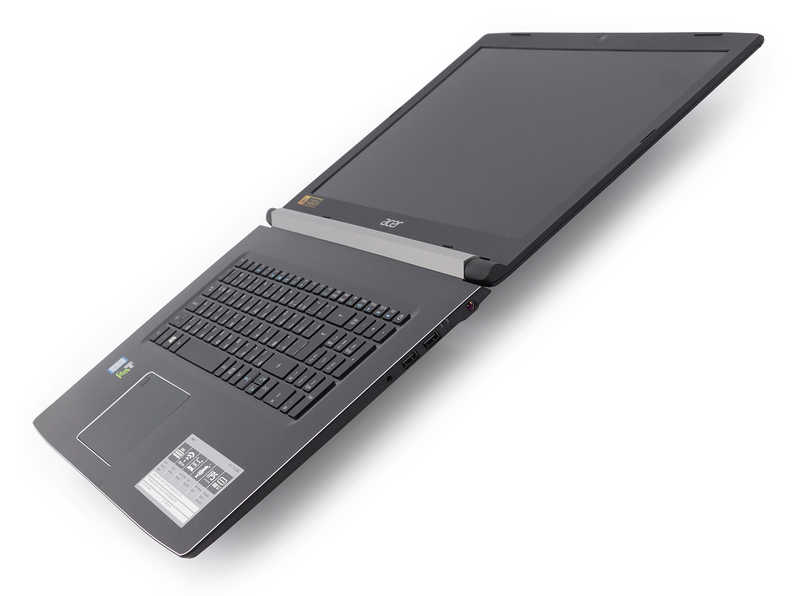 Easily, the Aspire 7 puts to shame most of the 17-inch laptops out there. The loudspeakers provide clean reproduction of the low, mid and high frequencies without any noticeable distortions. Battery life isn’t exactly impressive but it’s a little above the average for a 17-inch high-performance notebook. It seems that the 48Wh charge of the battery keeps the system running for quite some time during web browsing but fails to impress when it comes to video playback away from the plug. All tests were performed with the usual settings – Wi-Fi turned on, screen brightness set to 120 cd/m2 and Windows power saving mode turned on. Good web browsing score – 409 minutes (6 hours and 49 minutes). The video playback score is considerably lower – 288 minutes (4 hours and 48 minutes). This test got the most of the battery since it’s the most demanding one and surely, you won’t start a gaming session away from the power source but you can still squeeze 105 minutes (1 hour and 45 minutes) if needed. ntel’s Core i5-7300HQ is part of the 7th Generation Kaby Lake CPUs and it’s the direct successor of the Core i5-6300HQ (Skylake). It’s also based on the same architecture as the aforementioned chip with little differences that should bring a small performance increase and a bump in power consumption. However, the new CPU is clocked at 2.5 GHz and its Turbo Boost frequency is 3.5 GHz opposed to the 2.3 – 3.2 GHz clocks on the previous Core i5-6300HQ. We have the same 4/4 core/thread count 6MB last level cache, a TDP of 45W which includes the iGPU and the dual-channel DDR4 memory controller. Speaking of the former, the chip integrates the newer generation Intel HD Graphics 630 graphics chip clocked at 350 – 1000 MHz. Fritz is a chess benchmark that tests the computing capabilities of the CPU with various chess moves. 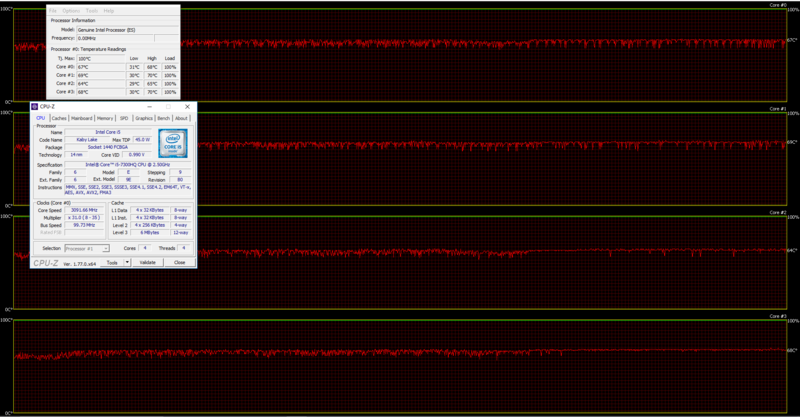 The Intel Core i7-8550U managed to get 9.858 million moves per second. For comparison, one of the most powerful computers, Deep(er) Blue, was able to squeeze out 200 million moves per second. In 1997 Deep(er) Blue even beat the famous Garry Kasparov with 3.5 to 2.5. The GeForce GTX 1050 GPU for laptops is part of the latest NVIDIA Pascal lineup of GPUs featuring a brand new architecture design but on contrary to the rest of the GPUs from NVIDIA’s lineup, the GTX 1050 and 1050 Ti feature a Samsung-made FinFET 14nm chip instead of the TSMC 16nm found in the GTX 1060, 1070 and 1080. The graphics card is based on the GP107 chip paired with 4GB of GDDR5 memory via 128-bit interface. 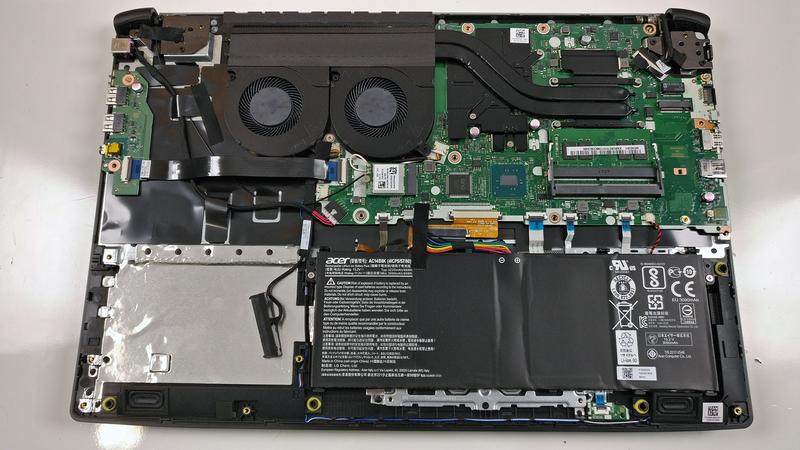 Since the GTX 1050 is quite dependent on the cooling design, its performance may vary but if the laptop handles the GPU well and shouldn’t be much different from its desktop counterpart. Anyway, the GPU operates at relatively high frequencies (1354 – 1493 MHz) but incorporates the same amount of CUDA cores (640) while the memory is clocked at 7000 MHz (effective). These specs ensure a huge performance boost over the previous generation of Maxwell GPUs. For instance, the GTX 1050 performs better than the GTX 960M and can be compared to the GTX 965M’s capabilities while running at similar to the GTX 960M’s TDP of around 40-50W. However, along with all the power consumption and performance improvements, the GPU now supports essential features like DisplayPort 1.4, HDMI 2.0b, HDR, improved H.265 encoding, and decoding. Here you can see an approximate comparison between the GPUs that can be found in the Acer Aspire 7 (A717-71G/72G) models on the market. 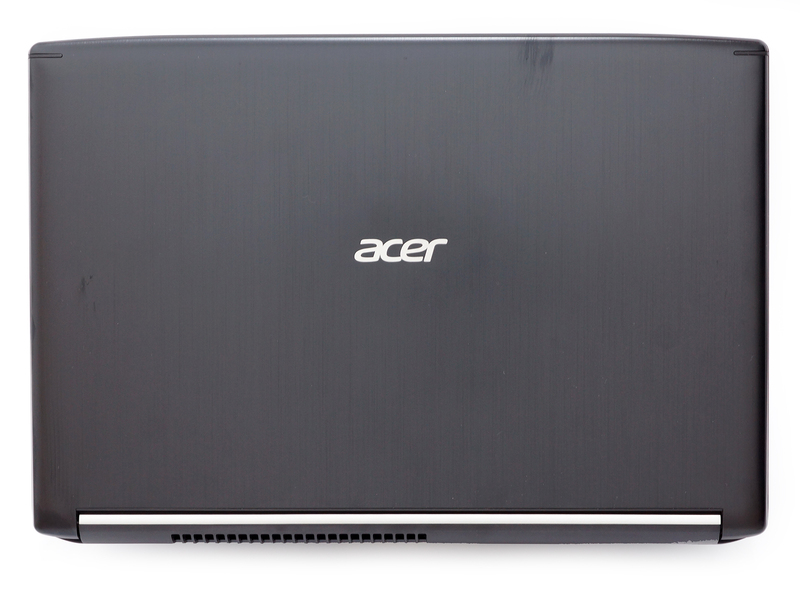 This way you can decide for yourself which Acer Aspire 7 (A717-71G/72G) model is the best bang for your buck. The stress tests that we perform don’t represent real-life use since even the most demanding games don’t require 100% CPU and GPU load for such long periods of time. However, it’s still the most reliable way to assess the overall effectiveness and stability of the cooling system. We started off with 100% CPU load for about an hour only to see that the system utilizes the full performance of the processor without any issues. Turning on the GPU stress test didn’t change things too much – the Core i5-7300HQ ran stable at 3.1 GHz while the GTX 1050 was running at frosty 67 °C while utilizing the full performance of the chip – 1670 MHz. 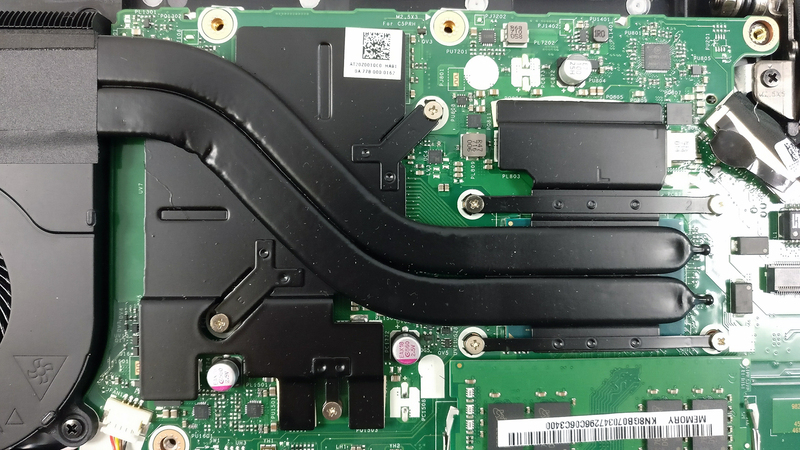 To be honest, we were pretty surprised by the results because the current cooling design has proven to be ineffective in all of the laptops we’ve tested so far. But our best guess is that the Core i5-7300HQ and the GTX 1050 aren’t so demanding and even this cooling design is enough to keep things cool and under control. In any case, we are extremely happy with the temperatures. Even external temperatures didn’t show any signs of overheating and more importantly, we noticed that the fans ran pretty silent considering the extreme nature of the stress test. 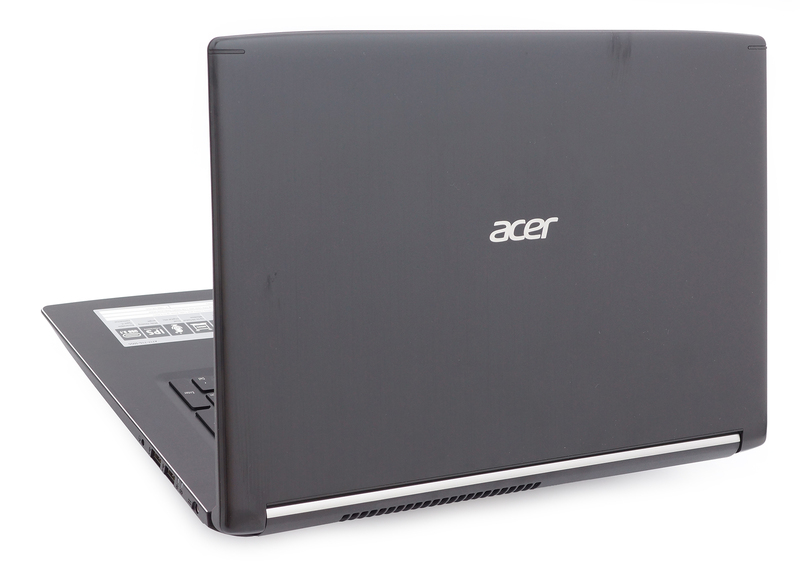 We were happy with the Acer Aspire 5 (17-inch model) and we are also extremely satisfied with the Aspire 7 as well. For the incremental increase in price, the Aspire 7 offers a significant upgrade not only in the hardware department but in terms of build quality as well. The aluminum lid and interior are hard to come by in this class, especially with a powerful hardware like this one. 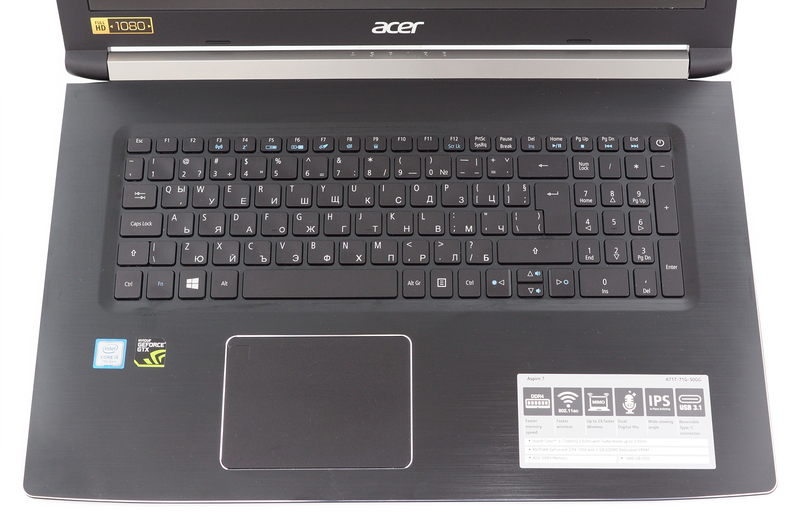 In addition, the keyboard and the touchpad feel way better than the ones we saw in the Aspire 5. Also, the layout isn’t really gaming-centric but to be fair, Acer never claimed it’s a gaming-oriented laptop in the first place. Despite the obvious bang for the buck configuration here (quad-core Core i5 + GTX 1050), the device surprises with excellent IPS display a well. Using the same panel as the Aspire 5 and other considerably more expensive gaming machines like the ASUS ROG GL702VM and the Lenovo Legion Y920, the 17-inch Aspire 7 is an ideal choice for multimedia and gaming on a budget. The LG screen is bright, has wide sRGB coverage, good contrast and doesn’t use PWM for regulating brightness. Of course, like with most performance 17-inch laptops, battery life isn’t amazing but it will last a few hours away from the plug when it comes to web browsing. Don’t expect too much for video playback, though. 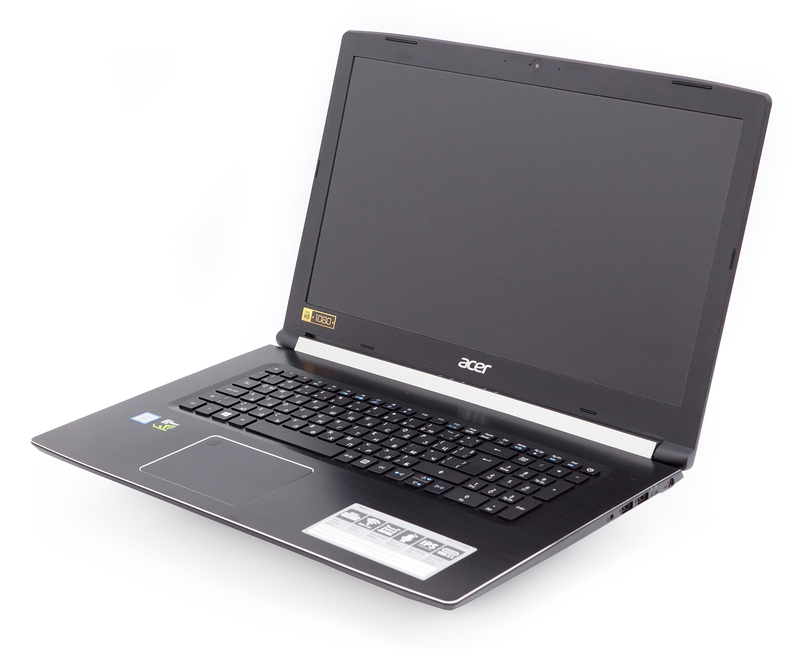 A more important aspect, in which the Aspire 7 excels, however, is the cooling design. According to our extensive stress tests, the cooling system can handle a lot of torture without breaking a sweat – the CPU and GPU will run cool most of the time while keeping noise emissions to a minimum. It came as a surprise because the design proved to be inefficient when paired with more powerful GTX 1050 Ti/GTX 1060 and Core i7-7700HQ. To be fair, it’s really hard not to recommend this high-performance budget laptop. It’s good for everyday work, for multimedia and even for gaming while costing just around €750 (since at the time of writing this review, the Aspire 7 is still not available in the US). But if all that power isn’t all that necessary, we recommend looking into the Aspire 5 as well as it offers just about the same user experience but with more balanced hardware capable of squeezing out better battery runtimes. Congratulations on the exhaustive review. The results of the stress tests are very good. This cooling system is a bit unbelievable. What tests do you use and what settings? We use Prime95 for CPU stress testing and Furmark for maximum GPU load. Both tests allow 100% CPU and 100% GPU stress testing. Hi, there’s a store selling this laptop or i think the 15 .6″ version of it. Aspire 7 a715-71g. It’s specs are i5 7300hq, 4gb ddr4 ram, 2tb hdd storage but with gtx 1050ti GPU. Is it a good buy for 400$? Excellent review! Do you have any images of screen backlight bleed?